The internet has taken what was initially a play on words and turned May the Fourth into a day of celebration called Star Wars Day. It has gone beyond the initial holiday and it has further been coopted to be adopted by consumer culture. To participate in yesterday’s “holiday,” DK Publishing released a comprehensive encyclopedia of all things within the Star Wars universe entitled Ultimate Star Wars. With the newest movie coming this December, Disney has cleaned up the Star Wars continuity and has made only the six movies to date, the Clone Wars cartoon of 2008, and the current Rebels cartoon to be cannon. Since this is now the single storyline of the Star Wars universe, Ultimate Star Wars only covers these media, but does so very comprehensively. While most books on Star Wars look at the media chronologically, either from publishing or story timeline to tell the story, Star Wars Universe gives a different take. The book breaks down Star Wars into characters and creatures, locations, technology, and vehicles. While the book makes use of timeline, it focuses more on the individual topics. Each focus within the different sections is given space dependent on the importance of the individual aspect within the category. For instance, in the character section, minor characters will get a paragraph telling how they contributed within the story and what happened to them, while a major character will get a double page spread telling their entire histories with multiple pictures and a timeline of their story. 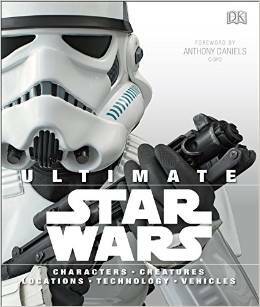 Ultimate Star Wars is easily the most comprehensive book to cover the six movies and two television series. Without relying on any expanded universe or details not found in the movies, it educates on all aspects of the Star Wars universe to appear on screen and illustrates with clear images of everything. A book requiring four authors (Ryder Windham, Daniel Wallace, Adam Bray, and Tricia Barr) to cover so much material is evident and a great reference for all Star Wars fans.